With the cooling autumn weather and a fresh new season, why not set a fresh goal to get out there and network more? Give your business one big final push before the end of the year arrives. If your networking experiences are anything like ours, you often leave feeling invigorated, motivated, and with a stack of business cards from new contacts! Did you meet someone you want to follow up with? Develop a system for marking business cards so you don’t lose valuable contact opportunities. You can use your own brand of shorthand for this purpose or, if you prefer not to stop to take notes, you can pick up a package of map dots to color code contacts. Whatever your method, be sure to record this information before you forget it. You met some fantastic contacts, but now what? 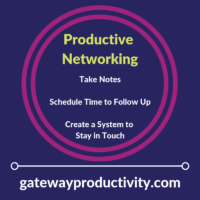 Every time you attend a networking event you should make time in your calendar no more than 72 business hours after the event to follow up with your new contacts. Having the future time marked on your calendar before the event even happens ensures that you don’t let these important contacts slip away. Now that you’ve followed up once, how do you plan to stay in touch? Do you want to connect on LinkedIn? Invite your contact out for coffee? Send a handwritten note? If you know the steps you want to take with each contact in advance, follow-through is as easy as checking items off of your list.